A driver who is feared dead reportedly hit the central reservation before crashing into the embankment on the M1 near Sheffield. 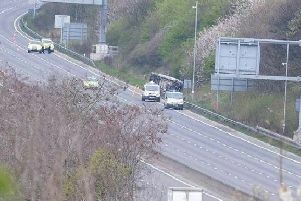 The M1 is currently closed southbound between junctions 34 and 35 near Meadowhall following the serious crash which happened this morning, April 10. The Yorkshire Air Ambulance and other emergency services were called out to the scene at about 7am, with one eyewitness saying that the driver ‘hit the central reservation and went into the embankment" during the crash. Traffic was halted and the road is now closed. 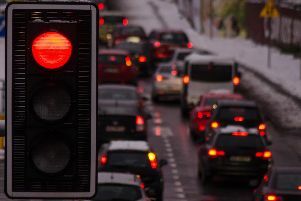 Highways England said that trapped traffic has been released past the scene but the road will remain closed now the traffic has been released, while investigations continue. A source told the Sheffield Star the incident is being treated as a fatal collision, but this has not yet been confirmed officially by police. Highways England have also confirmed that the M1 Southbound between junctions 35 and 34 will be closed until "4pm at the earliest". Traffic, left, and the air ambulance on the M1.